•	Terminal A: It’s hard to be away from Boston for too long without getting a craving for a Harpoon. Luckily, the Harpoon Tap Room in the Terminal A satellite makes it easy to have one last IPA before you wedge into a middle seat en route to Atlanta. With ten rotating taps and a hearty menu of regional fare, you could easily turn this into an all-day affair, but please don’t—Mom is waiting for you. •	Terminal B: Thanks to a 2014 revamp that brought the newly-merged United under one roof, Terminal B has the best dining scene in the airport. Be sure to dress for the occasion, as the glitterati vibe of Stephanie’s on Newbury has expanded to the Logan concourse. Stephanie’s at the airport serves potent Executive Mimosas and a crab cake sandwich that gives the food upstairs in the United lounge an inferiority complex. Nearby, the modern Legal Sea Foods (one of many Legal outposts at the airport) has a sleek bar with plenty of big screens to watch the Bowl Game you were supposed to be at had it not been for the TSA agent who made you miss your flight (did you REALLY need to bring a full bottle of shampoo in your carry-on, bro?). 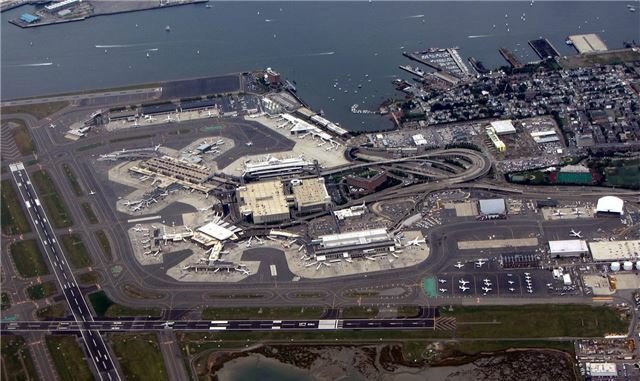 •	Terminal C: Despite being home to JetBlue, the airport’s biggest tenant, Terminal C is a bit lackluster with its watering holes. Nevertheless, Wolfgang Puck serves up scrumptious fare for far less than you’re going to shell out at Spago in Beverly Hills, and the friendly bartenders will never leave you alone long enough to experience an empty glass. •	Terminal E: Before you scoot to the likes of Dubai or Hong Kong from Logan’s international terminal, raise a glass or two to your jetsetting fabulosity. Why wait until you’re actually in Bordeaux to sip that sauce? The wine list at Vino Volo spans the globe as much as the nearby departures sign. For those of you looking for a final Beantown bite, Dine Boston before the security checkpoint welcomes regional chefs each season to curate the menu and give guests local flavor with each nibble.